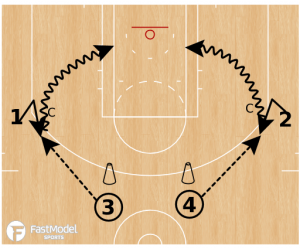 This drill from Jay Wright and Villanova came from the FastModel Sports Basketball Plays and Drills Library. The drill was contributed by Mike Shaughnessy is a Player Development Coach for Dr1ven Training LLC. Villanova is known for being a very fundamentally sound basketball team. They do a tremendous job of valuing the ball (1.4 Asst./TO Ratio) and finish around the rim at a high percentage (66% avg. past 2 years). This is a drill that the men’s basketball team does in practice throughout the year to work on getting open versus pressure, working on their triple threat (pivots, jabs), and finishing strong around the basket. There are also two videos with the diagrams of the Villanova coaching staff teaching the drill (above the diagrams) and then of the players applying the skills in games (below the diagrams). This video came from the Jay Wright Open Practice Skill Development DVD. You can click the link for more information about the DVD. Click the play arrow to view the Youtube video. I do realize that there are times in the video when the players travel. You can clean that up in your practices. The idea behind posting the video is for you to see the Villanova staff’s coaching points to possibly apply to your fundamental drills. Player’s 1 and 2 get open versus the pressure given by the coaches by stepping across their feet and body to put them on their hip/back similar to a post up. This is to have assurance that the defender can’t shoot the passing lane. Player’s 3 & 4 will pass to the outside hand away from the coaches. Player’s 1 & 2 will release to the basketball on the flight of the pass. To create space and face up to the basket. Player’s 1 & 2 will work out of their triple threat utilizing jabs and rip through’s to drive to the basket. Player’s will finish off a jump stop (two feet) to finish strong at the rim. Player’s 3 & 4 would replace player’s 1 & 2’s spots after they drive. 1 & 2 will rebound their ball and go to the end of the line where the cones are. 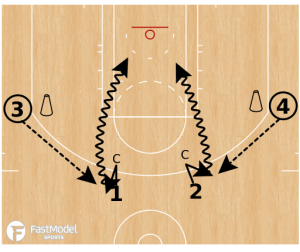 The same drill is performed with player’s 3 & 4 entering the ball to 1 & 2 lane line extended. Player’s will work out their triple threat using their pivot and jabs to drive down the alley. Player’s will use a jump stop to play off 2 feet to finish around the rim.